It’s not a moisturizer. It’s more than a primer. Revitalift® Miracle Blur from L’Oreal is the first-of-its-kind Instant Skin Smoother that instantly erases the look of lines, wrinkles and pores. Its unique, cushiony texture blends seamlessly into skin so it instantly looks and feels smooth, leaving a velvet-soft matte finish. Apply after moisturizer and blend smoothly and evenly into skin. Wear alone for a flawless matte finish or under foundation for smoother, more even application and wear. Ideal for all skin tones. Explore the entire Revitalift® Collection, too here. 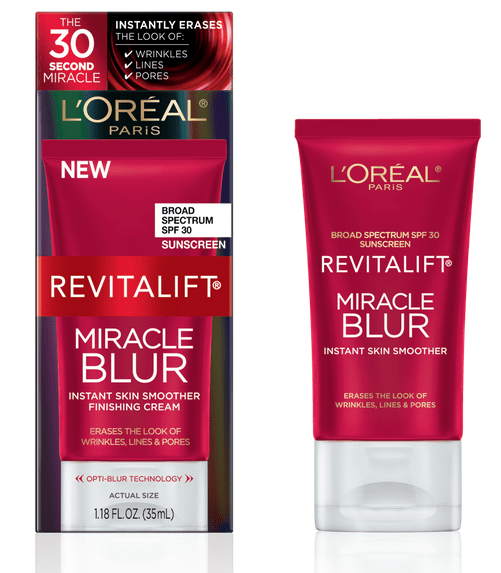 One (1) lucky Lady and the Blog reader will win their own L’Oreal Revitalift® Miracle Blur to try!! I currently dont have a favorite product but would love to try one! Miracle Blur sounds exactly like what my face needs. I love L’Oreal! I don’t have a favorite yet! I have used their hair color and like it, though. I heard great things about this product. Would LOVE to try it! I’ve never tried any of their productS! I always use L’Oreal Hair Dye, but my Favorite everyday product is the Revitalift triple power deep acting moisturizer. i love their shampoos and conditioners. I love the Magic BB Cream and the 24 hour Infallible Eye Shadows!